Greater Noida (9/2/2019): Education is the most important part of one’s life. Whether it is the higher education part or play school part. Happy Hours School in Greater Noida, today celebrated its glorious 14th annual day in YMCA Auditorium. It is a play school with a vision to make the children of play group age to be more confident and friendly with their peers. 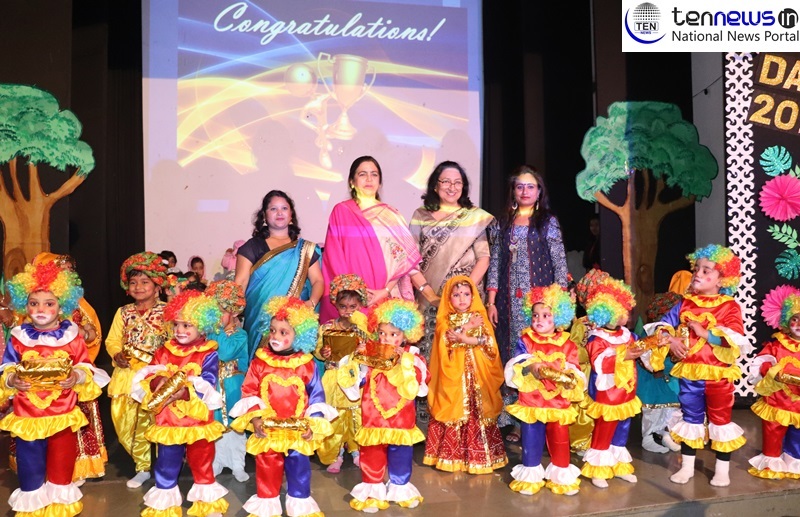 The chief guest of the event was Dr Rekha Bhushan, Principal , Cambridge School in Greater Noida. Also the event was graced by Chandra Shekhar Garge, President, Ganraj Maharashtra Mitra Mandal as the guest of honor. The annual day started with lighting of lamp by the Chief Guest. Following this a welcome dance was performed by the children of the school. Several activities like dance and stage play were presented by the children with great enthusiasm and energy. A beautiful dance performance on the song ‘Love You Zindagi’ was also done by the children. Folk dance and a beautiful act on 3 little pig’s story received the loudest applause from the audience. Every child was presented a gift by the chief guest Dr Rekha , guest of honors Gajanan Mali and Sangeeta Maitra . Parents present in large numbers enjoyed the presentations by the tiny tots . While addressing the audience the chief guest said “I’ve been in teaching line for almost 25 years of my life and I can assure that this age group is the hardest to handle and to make them work according to you. But after seeing these beautiful performances I congratulate all the teachers for their remarkable job”. School Principal Ms Amla Lal while talking to Ten News said “that our school’s mission is to make these children confident in whatever they are doing, and I thank the parents for their support and trust that they have reposed in us”. She further added that “play school has become a must for every child in today’s generation. It teaches them to incorporate a habit of getting up early and to spend time outside their homes which eventually they have to do when they will get older. Also it helps them in gaining confidence and understand the way of dealing with things at the initial stage of their life”. The annual day culminated with a vote of thanks and National Anthem ..